Ben Davis is a regulatory and transactional lawyer. He has advised North Carolina banks on matters involving regulatory compliance, corporate governance, check negotiation, electronic payments systems, wire transfer fraud, financial privacy, internet banking, and remote deposit capture services. He also represents media clients in licensing proceedings, regulatory compliance, and transactional and tax matters. 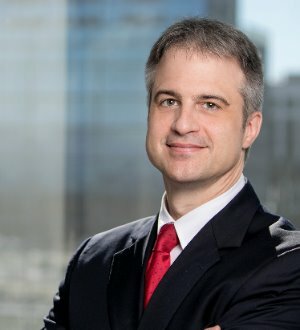 After graduating law school, Ben served on active duty in the Pentagon from 1998-2002, as a military attorney in the Office of the Army General Counsel. As an Assistant to the Army General counsel, he handled legal issues involving Arlington National Cemetery, the turn-over of the Panama Canal, and domestic and international Corps of Engineers projects. "Updated FFIEC Authentication Guidance Raises the Bar for Online Security Procedures," Carolina Banker, Winter 2011. "Regulation Z: Restrictions on Mortgage Loan Originator Compensation," Legal Memorandum, Vol. 43, No. 2, 2011, North Carolina Bankers Association. "North Carolina Bankers Guide to Powers of Attorney," 2nd Edition (published by North Carolina Bankers Association 2008). "E-SIGN and Electronic Statements," Legal Memorandum, Vol. 39, No. 9, 2007, North Carolina Bankers Association. "North Carolina Identity Theft Protection Act," Legal Memorandum, Vol. 37, No. 14, 2005, North Carolina Bankers Association. "Check 21 and Check Retention Requirements," Legal Memorandum, Vol. 36, No. 10, 2004, North Carolina Bankers Association. "Check 21 Act," Legal Memorandum, Vol. 36, No. 6, 2004, North Carolina Bankers Association. Co-Author, "Child Support Enforcement and North Carolina Banks," Legal Memorandum, Vol. 35, No. 10, 2003, North Carolina Bankers Association.